A BIG thanks to Tony Austin from Grumpy Warthog Enterprises who is the creator of the TUSKFORCE self defence belt and was kind enough to provide the detailed content for this article. Many South Africans buy pepper spray, tasers and other self-defence products but, sadly they are neither prepared nor able to quickly access them in an emergency. A simple solution to this common problem is the TUSKFORCE self defence belt. This belt will allow you to quickly and effectively access your self-defence weapons when the need arises. While the average civilian is not equipped to handle dangerous criminals, there are many ways in which an average person could prepare themselves to deal with the threat posed by opportunistic criminals. Just as a warthog’s tusks pose a threat to predators, even those far larger than the warthog, so the new TUSKFORCE self defence belt can equip an ordinary person to protect themselves against those who would harm them. The TUSKFORCE self defence belt was born out of appreciation of just how vulnerable an ordinary person, with normal human sensitivities and scruples, can be when confronted by a criminal who is prepared to do whatever it takes to get what he wants, or someone whose desperation makes him dangerous. Considerable thought went into the design and construction of the belt in an effort to make it effective, durable and comfortable. When defending yourself from an attacker it is critical to use the defend-alert tactic. The defence aspect entails defending yourself physically should you be able to do so. This is where pepper spray, tasers and other weapons can be used. The second aspect is that of immediately alerting others to your situation and, the fastest way to do this, is by using an air horn. While you may not be able to quickly call for help, using an air horn will alert others in your immediate vicinity that you need help. Once the defend-alert tactic has been used – you can push your panic button and call police. The base belt comprises of polypropylene webbing and a side-release buckle. At the back it has a section of elastic to make it sit snugly yet comfortably, notably for athletes, cyclists, outdoor enthusiasts and others who work outdoors or in dangerous areas. Reflective tape was incorporated in the belt design to promote visibility of the wearer to rescue services and road users, after dark or in low light conditions. The first generation has reflective tape stitched to it, while future releases will have reflective material right around the belt, applied directly to the webbing. 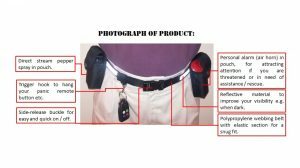 The active components of the belt include the personal alarm (air horn) and the direct stream pepper spray which come with the belt, each sitting snugly in its own pouch. The belt design allows for the pouches to be positioned as the wearer finds it comfortable and can then be secured so that they do not slide around on the belt. Pepper spray is one of the best non-lethal self defence weapons that you can have and, in many situations is easier and more effective than using a taser. You must know how to use pepper spray correctly, in the case of the direct stream pepper spray which comes with the TUSKFORCE self defence belt, you must always spray across the eyes in a horizontal motion. Criminals do not likehaving attention drawn to them when in the act of doing wrong and an air horn will do exactly that. An air horn can also disorientate someone when the blast is directed straight into their face, giving the intended victim time to act e.g. by spraying the assailant with a jet of pepper spray or better yet, the blast of the air horn may get the assailant to have second thoughts about continuing the attack. The horn can actually be discharged while in the pouch, so no need to get it out. The final touch is a trigger hook mounted on the belt for the wearer to hang a panic remote button or keys. This will allow for them to activate their home or business alarm while in range, thus also alerting their security company to their need for assistance. 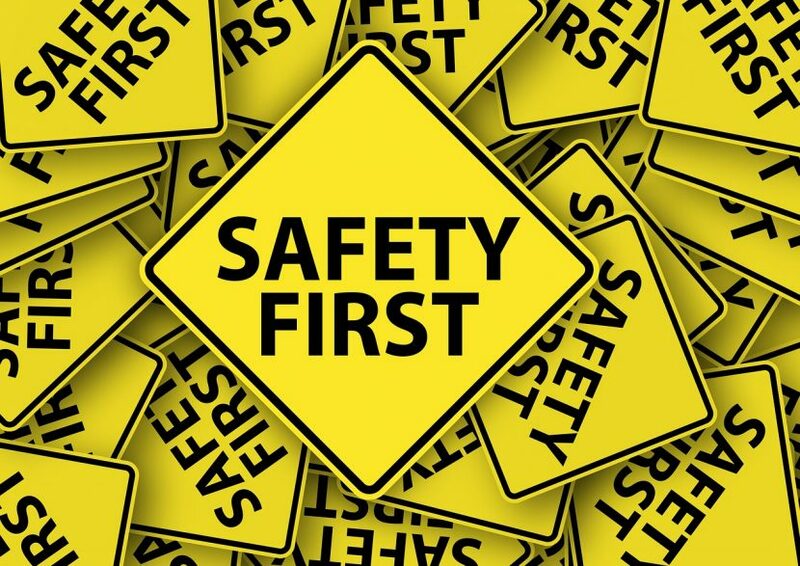 Just as people rarely have their pepper spray or other self defence weapons in hand when they need them, many people also tend to put their panic button in a place that they cannot get to in an emergency. Unless you carry your panic button on your person, the point of a panic button is completely defeated. Who should use the TUSKFORCE Self-Defence Belt? The TUSKFORCE self defence belt is ideal for outdoor enthusiasts, cyclists, joggers, housewives or lone workers who spend a lot of time alone or in secluded areas. Not only will you be able to quickly access your self-defence weapons but you can also comfortably and securely hang two or three keys as well as a panic remote on the self-defence belt. The TUSKFORCE Self Defence belt is also ideal for people who use public transport or walk to work. Anyone vulnerable to assault such as people who live alone will also benefit from this product which offers greater personal security in a comfortable and convenient way. You can buy the TUSKFORCE self defence belt directly from its designer and supplier Grumpy Warthog Enterprises. This product has only recently been launched – be the first to get it and come back to leave a review!